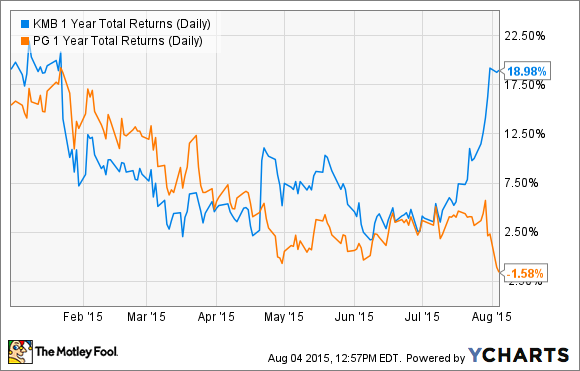 Here's why Kimberly-Clark is a better dividend stock to buy than close rival P&G. In the consumer-staples sector, some investors may glance at Procter & Gamble (NYSE:PG) and stop looking there. When screening this industry for investment opportunities, P&G stands out. It's a huge company with a long history of paying dividends. But among consumer staples, it's not the only one. In fact, there are other stocks with a similar business model that reward their shareholders just as generously as P&G. Moreover, P&G is really struggling right now. Its sales are in decline, and not just because of currency effects. It's seeing a much more concerning decline in underlying demand for its products. The company is embarking on a massive portfolio restructuring, but this will take time to materialize. For these reasons, I'd suggest investors take a closer look at one of P&G's closest competitors, Kimberly-Clark Corporation (NYSE:KMB). The global economy continues to expand at a steady rate, but P&G is standing still. Its total revenue declined 5% in fiscal 2015, to $76.3 billion, and diluted GAAP earnings per share from continuing operations fell 21% year over year.uch of the damage was due to the strong U.S. dollar. Negative effects from currency shaved off 6 full percentage points from P&G's revenue growth last year. Excluding this matter, its organic revenue would have increased 1%, which is growth, but still unimpressive. Plus, not all of P&G's woes can be attributed to foreign exchange. Last fiscal year, volumes fell 4% in the beauty, hair, and personal-care segment, 3% in grooming, and 1% in healthcare and baby, feminine, and family care. These declines cannot be written off by artificial currency fluctuations; instead, they represents a more concerning decline in underlying demand. This is why P&G has embarked on an aggressive divestment path. It has struck major deals over the past year to sell off some of its brands that weren't growing. Last year, P&G sold its Duracell battery brand to Warren Buffett's Berkshire Hathaway for $4.7 billion. Then, earlier this year, P&G sold a collection of 43 beauty brands to Coty for a cool $12.5 billion, including Dolce & Gabbana, Gucci, Hugo Boss, Cover Girl, and Max Factor. Also included was the Wella hair-products business. While P&G struggles to reinvigorate its product lineup and get the top line growing again, Kimberly-Clark is seeing no such slowdown. Its organic revenue grew 4% last quarter, much better than P&G's performance. One of the advantages Kimberly-Clark has over P&G is its higher-performing international business. Last quarter, Kimberly-Clark realized 10% organic sales growth from the emerging markets. Another key difference between the two is the performance in their respective personal-care businesses, which is a critical segment for both companies. For example, P&G's personal-care segment accounts for approximately 23% of total revenue, but sales volumes there declined 6% last quarter and operating profit declined 1%. Meanwhile, Kimberly-Clark's personal-care segment grew volumes by 3% and operating profit by 4% last quarter, year over year. Its Huggies brand led to strong 7% volume growth in the emerging markets, year over year. Kimberly-Clark shares are up 1% year to date, while P&G shares have lost 16% so far in 2015. The bottom line is that Kimberly-Clark has handily outperformed P&G this year, and that isn't likely to change anytime soon. P&G is in the middle of a huge turnaround, which may prove effective but will nonetheless take time. Management doesn't expect the Duracell transaction to close until the first quarter next year, and the Coty deal won't close until about a year from now. Until then, P&G's growth could continue to flatline. P&G offers a slightly higher dividend yield than Kimberly-Clark, 3.4% to 3%, but that has more to do with P&G's falling share price than stronger dividend growth. For a much better mix of growth and income, go with Kimberly-Clark.